SB 40 Band Sealer | PAK Automation Ltd. 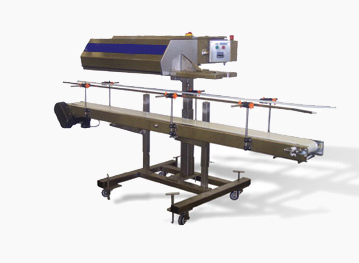 The Supersealer SB40 Rotary Band Sealer continuously seals a wide range of bag materials at a high speed. This machine has a lift hood for easy access to the interior of the sealer. With it’s 4 heaters the speed of the machine will do up to 120 fpm. These and many more features describes the new innovative Supersealer SB40 designed to create the “Perfect Seal” for applications like meat and poultry. Bag range material: Sealable up to 40 mill. Seal wheels: 1/2”, 3/4” wide. Power: 110 VAC, 1 Ph, 60 Hz, 10 Amp. preferred in food and other industries. Unique visually automatic band tensioning system. decreased with a turn of a screw. Simple set up and adjustment.